When I found out I was going to Thailand, it goes without saying that I was excited about visiting the beautiful temples, soaking up a new culture and touring the picturesque islands. But, if I’m brutally honest, the thing I was most looking forward to was the food. I absolutely love Thai food – red and green curries, tom yum soup, fried noodles – I could go on. So naturally, it became my mission to hunt down the very best cuisine I could find. Here are my favourite dishes, but be warned: don’t read this on an empty stomach! Breakfast is my favourite meal of the day and at Keemala Phuket, it really didn’t disappoint. 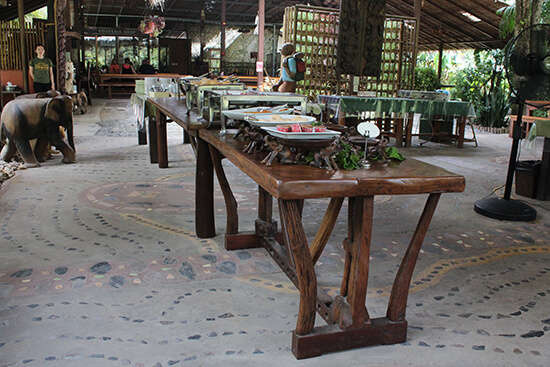 The resort is famed for its holistic gastronomic experience, and offers a 'Healthy Living Cuisine' version of its menu. 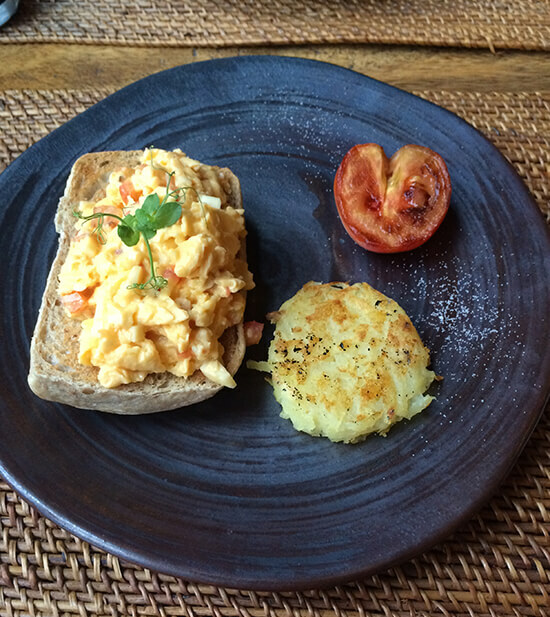 You can tailor every dish to your exact tastes, and I opted for creamy scrambled egg and smoked salmon on lightly-toasted sourdough bread, with a hash brown and tomato on the side. The menu is so vast; it even includes dim sum, which my dining partner enjoyed before food jealousy got the better of him. He then treated himself to a double breakfast and ordered the same dish as me – when on holiday! 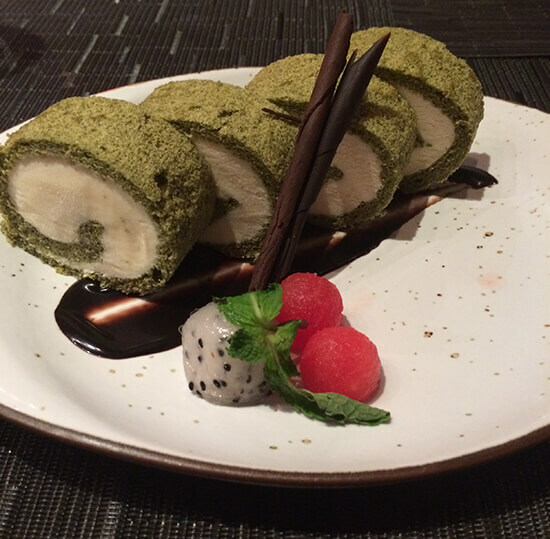 It’s hard to know where to start when it comes to the cuisine at Andara in Phuket. Here, you can look forward to an authentic Thai experience at its very best, all carefully prepared at the SILK Restaurant by head chef Tino Rominger. We were treated to a selection of dishes which were hand-picked for us by the expert chefs, and each one was as delicious as the next. After feasting on hoy shell pad asparagus and tasty tom yum goong, we were presented with my favourite dish; miang pla grob. Flaky white snapper fillet was served with a spicy salad of ginger, lemongrass, cashew nuts and mint leaves. I polished off the whole bowl and was still hungry for more! Thankfully, there was still the SILK ruam mit to go – prawns wrapped elaborately in Phuket noodles, fresh spring rolls, chicken wrapped in pandanus leaves, and fishcakes served with four Thai dipping sauces. It was honestly one of the best meals I have had and we were even lucky enough to watch head chef Tino in action, whipping up those mouth-watering flavours right before our eyes. My trip took me to Elephant Hills in Khao Sok National Park next. The experience includes one night at the Rainforest Camp, where you stay in a floating tent on the lake deep in the heart of the jungle, lulled to sleep by nothing but the noises of native animals. I therefore wasn’t expecting the food to be anything special; after all, you’re effectively in the middle of the rainforest and the camp can only be reached by boat. Yet it was here that I tasted one of the best hash browns I’ve ever had. Members of my group went so far as to claim they were the very best. Served with fresh scrambled egg and buttery toast, I’ll readily admit I went back for way more than I should have! Okay, so it’s not a Thai delicacy as such, but I felt the scrumptious sushi I enjoyed at the Centara Grand Resort in Krabi really had to be mentioned. The menu at on-site restaurant Suan Bua features plenty of Thai-style dishes, but we were treated to a Japanese banquet. 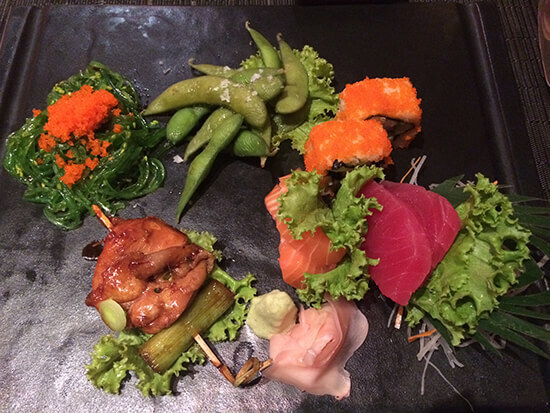 Starting with a colourful plate of sushi and sashimi, served with grilled chicken teriyaki and seaweed salad, we watched on in wonder as the chef then expertly prepared our main meal right in front of us. The surf and turf teppanyaki set includes delicious wagyu beef, tiger prawns and seared tuna, all cooked to perfection and served with fried rice. By this point I was suitably stuffed, but obviously I found space to polish off an entire plate of green tea and macadamia ice-cream; it’d be rude not to. I’m rounding off with another rogue entry, which was enjoyed on the final day of the trip at Rayavadee in Krabi. While I was desperate to enjoy lunch at the hotel’s luxurious Grotto restaurant, which is set beneath an ancient limestone cliff overlooking the ocean, we had to jump straight on a boat to our next destination, so the team prepared us a club sandwich to go. Three layers of lightly toasted bread filled with crispy bacon, an organic fried egg, chicken and salad, plus a side Caesar salad and crisps, was wolfed down in record time. I’m ashamed to say I didn’t even stop to capture a photograph of it in all its glory. I only wish we’d had time to sample the masala chicken curry too, which had been highly recommended by a friend. I fear I shall forever be attempting to recreate all of these enticing dishes, but nothing will come close to the flavours I experienced in the Land of Smiles. Feeling hungry? Tess travelled to Thailand on a tailor-made version of our Bangkok, Beach & Elephants Journey; experience some delicious dishes for yourself on this incredible holiday, from £1,885pp.